The Winnipeg Jets, in conjunction with the National Hockey League, today announced that forward Patrik Laine has been named the NHL’s First Star of the Month for November. Laine, 20, became the first player in NHL history to record a hat trick in three different countries. He opened the month with a three-goal performance in his native Finland at Hartwall Arena in Helsinki in a 4-2 Jets win over the Florida Panthers in the first game of the NHL Global Series on Nov. 1. The native of Tampere, Finland scored again the following night against the Panthers, but the Jets did not play again until Nov. 9 when Laine tallied for the third straight game in a 5-2 win against Colorado. Winnipeg went 2-0-1 on the next three games of a homestand, with the winger recording just one assist. 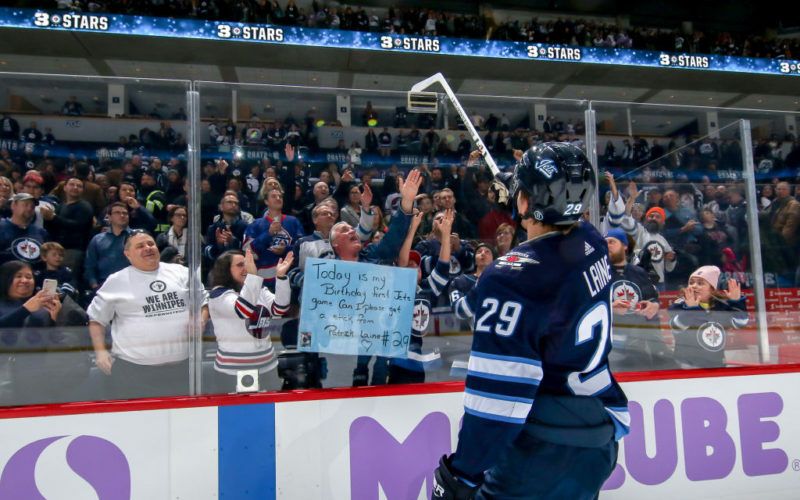 The Jets then hit the road for four games and Laine opened the trip with a hat trick, including the game winner, on Canadian soil in a 6-3 win over the Vancouver Canucks. He scored a pair of goals against Calgary and another versus Minnesota in losing efforts to stretch his goal streak to three. The final game of the road trip on Nov. 24 at St. Louis saw Laine record another hat trick – this time in the United States. However he went beyond that as he fired five goals in Winnipeg’s 8-4 win over the Blues. Laine became the first NHLer since Johan Franzen in 2011 to score five goals in a game, while being just the third player in league history to score five in a game before his 21st birthday, and only the fifth player since 1959-60 to score five goals in a game on only five shots. Winnipeg returned home from their trip and Laine failed to score for only the fourth time in the club’s 12 November tilts on Nov. 27 versus Pittsburgh. He returned to the scoresheet with a pair of goals in Winnipeg’s November finale on the 29th in a 6-5 win over Chicago. Laine’s first goal of the game gave him 20 on the season and was also the 100th goal of his NHL career, while his second tally gave him 18 goals in November. Laine (20 years, 224 days) became the fourth-youngest player in NHL history to score 100 goals. His 20 goals in the first 24 games tied Ilya Kovalchuk for the franchise record for fewest games to reach 20 markers. The 18 goals in November made Laine one of just 11 different players in league history to score 18-or-more in a calendar month and he was the first since Pavel Bure in March 1994. Laine also had 13 goals in the final six games of the month, as he became one of just seven players to record 13-or-more goals over six team games. On the season, Laine leads the NHL with 21 goals and 10 power play goals in 24 games played. His 101 career goals are more than any other player in the league since his debut in 2016-17. This is the first time in his career that Laine has been selected in the NHL’s Three Stars of the Month. He is the first Jets player to be selected since the franchise returned to Winnipeg. Laine joins Dustin Byfuglien (Nov. 2010 – Third Star), Ilya Kovalchuk (Feb. 2009 – First Star, Nov. 2007 – First Star, Oct. 2006 – Second Star) and Marian Hossa (Nov. 2006 – Second Star) as members of the franchise that have earned NHL Three Stars of the Month honours.